Sanquhar, previous spelling Sanchar comes from Gaelic "seann cathair" - "old fort". Sanquhar is now the first stop on the railway north of Dumfries - 28 miles away, though when the line was built stations were provided at Carronbridge, Thornhill, Closeburn, Auldgirth and Holywood. But things were even worse, with Sanquhar station closed between 1965 and 1994. From 1965 to 1984, only Kirkconnel remained open between Kilmarnock and Dumfries, thanks to the stupidity of Beeching and subsequent governments. After Carronbridge, 2 miles north of Thornhill the next opportunity to cross from Nithsdale to Clydesdale is the B797 connecting Mennock, just south of Sanquhar with Abington - through Wanlockhead and Leadhills - the highest villages in Scotland. The B7040 connects Leadhills to Elvanfoot. The other route through the Lowther Hills is from Crawick just north of Sanquhar to the B7078 (formerly A74) near Crawfordjohn. The original route appears to have been from Sanquhar, but the old bridge over the Cranwick Water is now reduced to little more than a footbridge - though it's still marked on maps as a road - the Google Street View camera car didn't attempt it. It is a relatively modern steel replacement for the original old bridge. The New Bridge (A76) is thought to date from 1825. The Enterkin pass, an old drove route from Enterkinfoot to Wanlockhead meets up with the Southern Upland Way high up (550m) on Lowther Hill - the old route continues through Wanlockhead to Spango Bridge and ultimately Muirkirk on the A70. ​Wanlockhead is the highest village in Scotland at 430m (1410 feet); or an average of 410m; or 467m (1531 feet) - the latter is the height claimed on the signs leading into the village. The building behind the sign is on the 460m contour, and appears to be the highest in Wanlockhead, though this structure just shy of the border between South Lanarkshire and Dumfries & Galloway, is close to an OS measured height of 466m on the road. The recording of highest villages is somewhat controversial and inexact - highest point within the village, or average height - and what counts as the extent of the village? Flash in Staffordshire is apparently the highest village in Great Britain at 463m (1519 feet). Their claim rests on the highest house in each village being measured by the OS - and Flash coming out on top..
Leadhills, across the border in South Lanarkshire, is the second highest village in Scotland at 395m (1295 feet), its Wikipedia page was amended in 2014 adding 55m to its height (though this claimed height is still less than Wanlockhead's maximum claim). In 2015 another user suggested that the OS were remeasuring the heights of the villages - neither change is referenced. The current OS map clearly shows that Wanlockhead is considerably higher..
Blackaddie Bridge was built in 1855, and appears to have replaced an earlier bridge about 200m downstream at the bottom of Queens Road - as shown on the 1900 map the remains of an old bridge are shown on what is now dry land. 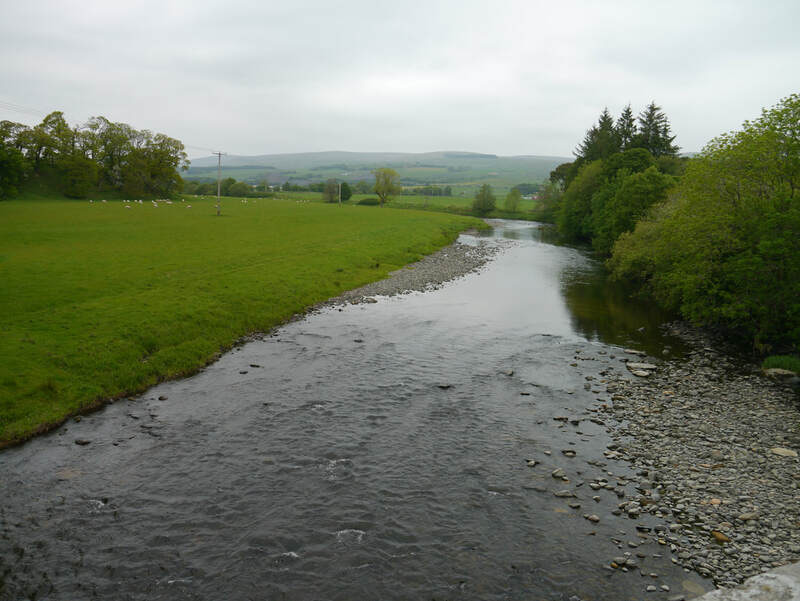 It is believed that the Nith's course was closer to Sanquhar in the past, and probably right up to the castle walls. Queens Road was earlier Queen Mary Road, and Mary (Queen of Scots) is believed to have used this road and the "totallie fallen down and ruined" bridge in her flight from the Battle of Langside in 1568. Further concerns about the state of the bridge are recorded in 1661, 1682, 1688 and 1697; after which some repairs appear to have been made, but there was the need for the erection of a footbridge in 1810 and subsequently a wooden bridge for carts. Eliock Bridge near Sanquhar, is dated to 1696, however, Scotland's Oldest Bridges quotes: "Sanquar parish records in 1661 note that Parliament sanctioned the raising of funds from all parishes for the rebuilding of the bridge at Sanquar." Given what's in other sources above, I think this must actually refer to the Sanquhar Bridge. There certainly appears to have been a bridge at Eliock prior to the current one (shown on the Roy Lowlands map, as Newbridge, the map doesn't show a bridge at Sanquhar), The current bridge is also dated to 1855. Sanquhar's nearest Whisky Shop is in Dumfries - TB Watson (aka Drambusters) (28 miles) or Robbie's Drams, Ayr (32 miles). Nearest distillery - Girvan/Ailsa Bay (41 miles) but it's not open to the public; nearest open to the public - Annandale (47 miles). ​Crawick Multiverse transformed from an abandoned open cast coal mine by Charles Jenks, is just north of Sanquhar and features amongst other things a modern stone circle. Kirkconnel is named after St Connell or Conal, but there were several saints of that name, one associated with Columba, one with St Mungo, but the ruins of this St Connel's Church near Kirkland 2 miles north of KIrkconnel, dates back to the 9th century. Earlier maps show the supposed site of his grave, now just marked as a cross on the 370m contour line a mile or so to the west. Kirkconnel wasn't much of a place before the local coal deposits were exploited from 1838, which became easier when the railway came through in 1850, ultimately more accommodation had to be built for the miners in Kelloholm, but the last of the mines closed in 1980, and though there are open-cast workings, employment opportunities locally are poor. Mennock (Gaelic - "mèineach" - "abounding in ore mines") is 2 miles SE of Sanquhar is where the B797 branches off following the Mennock Water towards Wanlockhead. Though on the railway, it never had a station, but there was a large goods depot - for the Leadhills and Wanlockhead mines. Eliock (Gaelic - "ailcheach" - "stony place") has a 17th Century Tower House, and a bridge over the Nith built in 1855, though there is reference to raising funds for rebuilding the bridge as long ago as 1661. For 2 miles south of Mennock, the A76 suddenly becomes bike friendly, with a parallel cycle path on the old line of the A76, then an on pavement cycle path, but this soon reverts to its normal ﻿cycle unfriendly self shortly before Glenairlie Bridge (built 1825) - though there are alternative routes on the other side of the Nith. Leadhills has a community website, though its news archives end in October 2016. The Leadhills Estate also has a website which includes details of how to get a £25 permit to pan for gold in the area.Leadhills' graveyard has a gravestone for John Taylor who supposedly died aged 137 in 1770, the gravestone shows he is buried beside his son Robert, born when his father was in his 90s! His "chief drink was malt liquor". A more detailed account of his life is given on a website dedicated to the Leadhills Mines and Miners. Wanlockhead is linked to Leadhills by the UK's highest adhesion railway - a short length (3/4 mile) of narrow gauge track laid on the remains of an old Caledonian Railway branch from the mainline at Elvanfoot in the height of lead mining days. The original line, shown on the 1920s map, was built in 1901, but only lasted until 1938 by which time most of the mines had closed. ﻿﻿Work has started﻿﻿ on extending the 2ft gauge line into Wanlockhead village with trains running the full route by 2020. 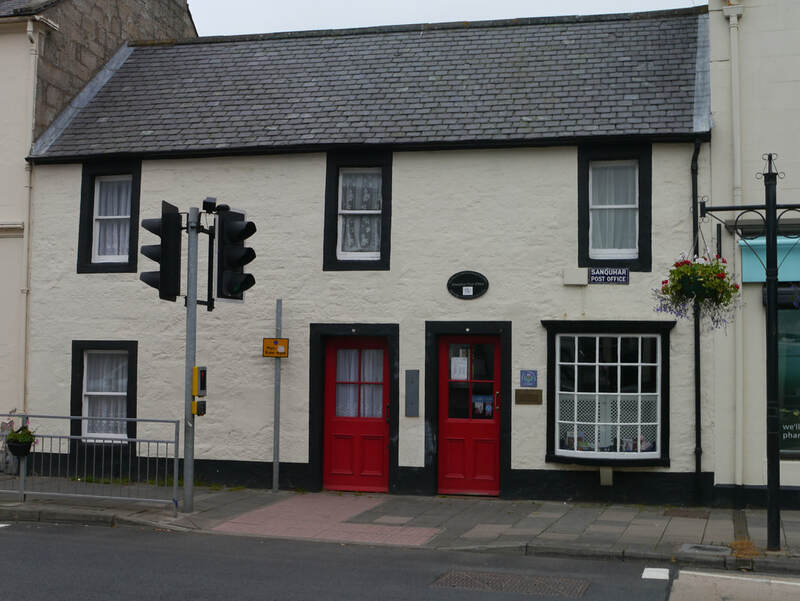 Wanlockhead also boasts the second oldest subscription lending library in the world - the oldest being in...Leadhills. Wanlockhead's library can be seen as part of the Museum of Lead Mining, where you can also try out gold panning, or even undertake courses in panning. Wanlockhead has Scotland's highest pub - and brewery, Lola Rose Brewery, which produces '1531 Beer with Altitude'. The Southern Upland Way passes through Wanlockhead. The "old fort" that Sanquhar takes its name from pre-dates the ruined castle by many centuries, and may have been the Corda referred to by Ptolemy. Even if not it is thought that there have been strongholds in the area for some time. The present Sanquhar Castle dates from around 1400, and is now a ruin, originally built by the Crichton family, sold in 1639 to the Duke of Queensberry from Drumlanrig - then abandoned by them after their original seat of Drumlanrig Castle had been rebuilt in 1695. Sir John Crichton-Stuart purchased the crumbling ruin in 1895 and started some restoration, but that seems to have ended with his death in 1900, and it has now fallen into disrepair - and been fenced off as a dangerous structure. 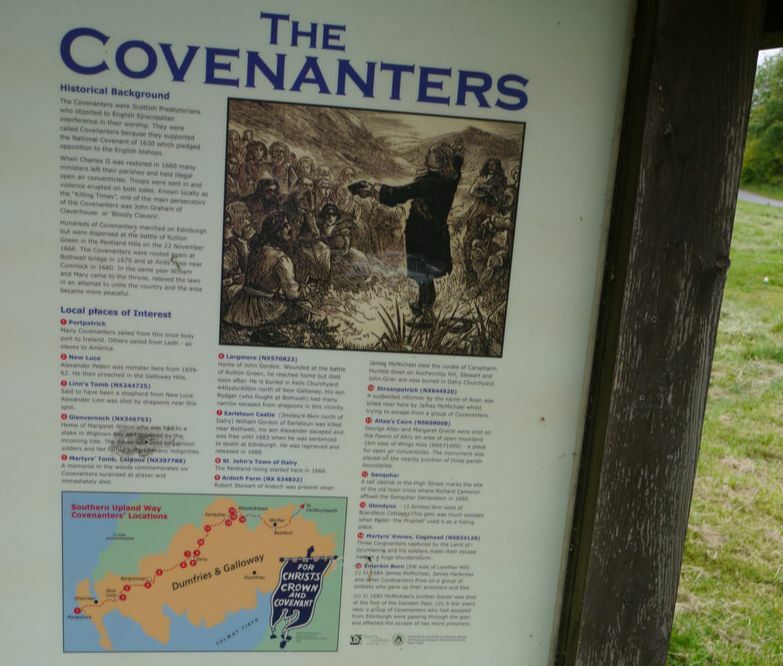 The SW and Sanquhar in particular were infamous for Covenanters and atrocities against them following the restoration of the monarchy in 1660. 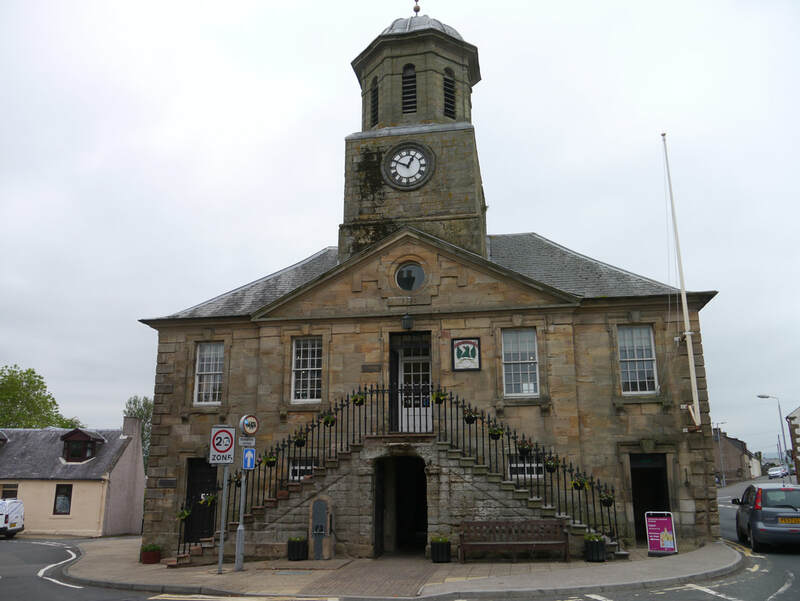 Following the assassination of Archbishop Sharp the previous year, 20 armed Covenanters rode into Sanquhar in 1680 and Richard Cameron read out a declaration which denounced and declared war on the King. This became known as the Sanquhar Declaration and was nailed to the mercat cross. Cameron was killed at the battle of Airds Moss, near Cumnock, the following year - a Covenanters Monument stands alongside Cameron's grave on Airds Moss. 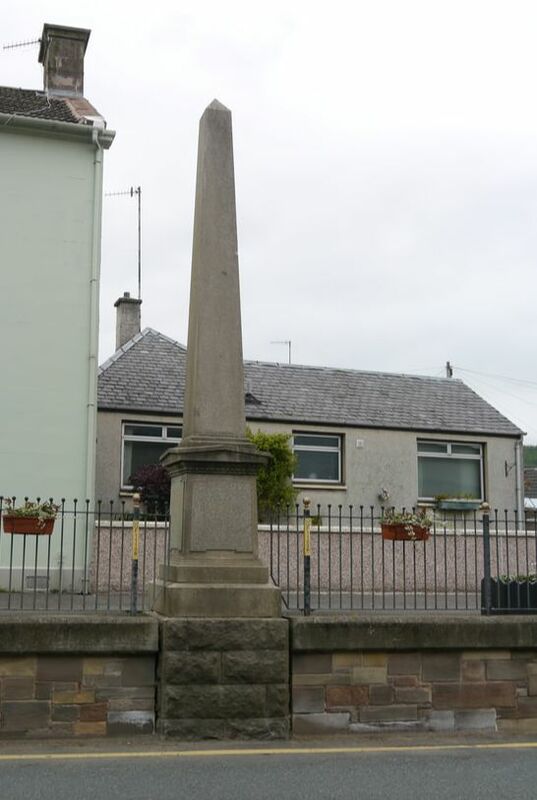 A further declaration was made by James Renwick in 1685 - he was executed in 1688, and there is a monument to him in Moniaive. In 1864 the mercat cross was replaced with a memorial to them. Many 'martyrs' were made during a period that became known as the Killing Time. 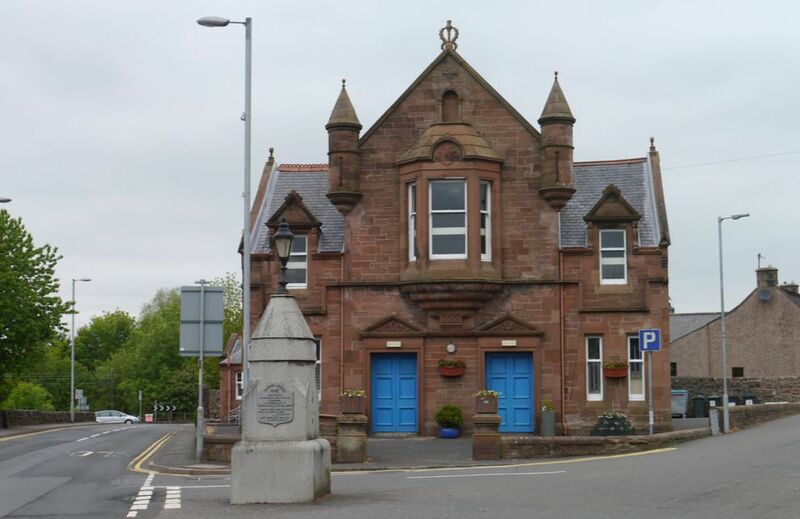 Sanquhar's Post Office is the oldest in the world dating to 1712 (though other dates of 1739 and 1763 have also been given - depending on what could have been said to be a formal Post Office at the time). Anyway, the Post Office celebrated its 300th anniversary in 2012; and more recently was saved from closure in 2015. St Bride's Church has a memorial to James "The Admirable Crichton" (1560-82) whose nickname was used by JM Barrie as a title for a play in 1902. The original got his nickname for his prodigous learning of the sciences and languages and served as a soldier in the French army. He then travelled in Italy and was employed by the Duke of Mantua, possibly as tutor to the Duke's son - who eventually became jealous of him and murdered him. 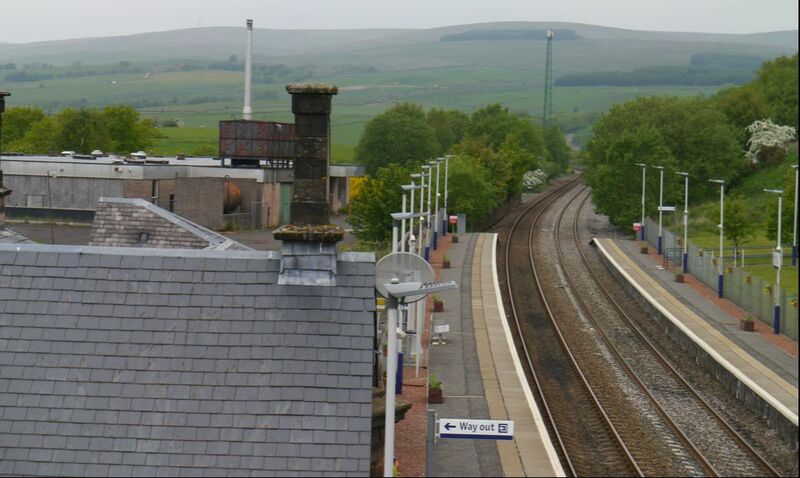 Sanquhar (SQH) rail station has ramped access to Platform 1 and 2 from St Mary's Street, Platform 1 also has level access from Station Road. Irregular trains to Glasgow & Kilmarnock, and Carlisle - some of which go on to Newcastle. There are unacceptably lengthy gaps in the timetable. On Sundays the service is frankly disgraceful only 2 trains each way - the first to Glasgow at 1417 and to Carlisle not until 1630! Live train times.